This is a wonderful image and is a highlight for anyone that is able to rise as the sun nears the horizon int he morning. While Jupiter is by far the largest planet in the Solar System it is surprising that this image show’s it so pronounced against that of Mars. Venus on the other hand came to be known to me as the morning star growing up in Australia as it always seemed to hang there throughout the year (or at least that’s what I remember as a child. Lets see what the experts had to say in the original post outlined below. Planet Earth’s horizon stretches across this recent Solar System group portrait, seen from the southern hemisphere’s Las Campanas Observatory. Taken before dawn it traces the ecliptic with a line-up familiar to November’s early morning risers. 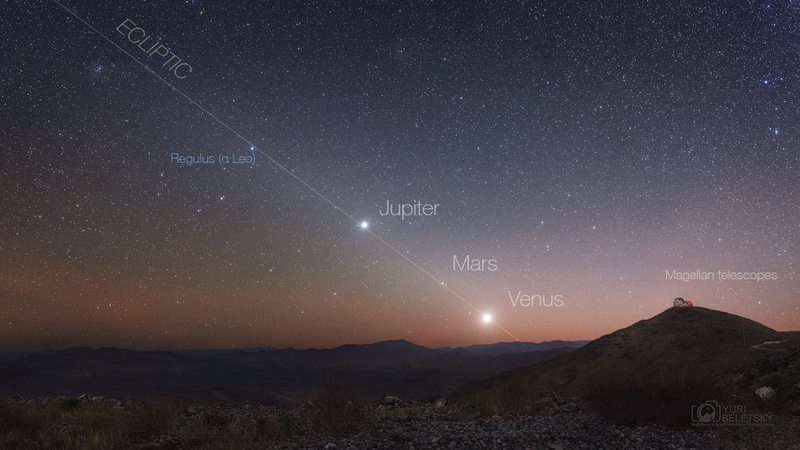 Toward the east are bright planets Venus, Mars, and Jupiter as well as Regulus, alpha star of the constellation Leo. Of course the planets are immersed in the faint glow of zodiacal light, visible from the dark site rising at an angle from the horizon. Sometimes known as the false dawn, it’s no accident the zodiacal light and planets both lie along the ecliptic. Formed in the flattened protoplanetary disk, the Solar System’s planet’s all orbit near the ecliptic plane, while dust near the plane scatters sunlight, the source of the faint zodiacal glow.